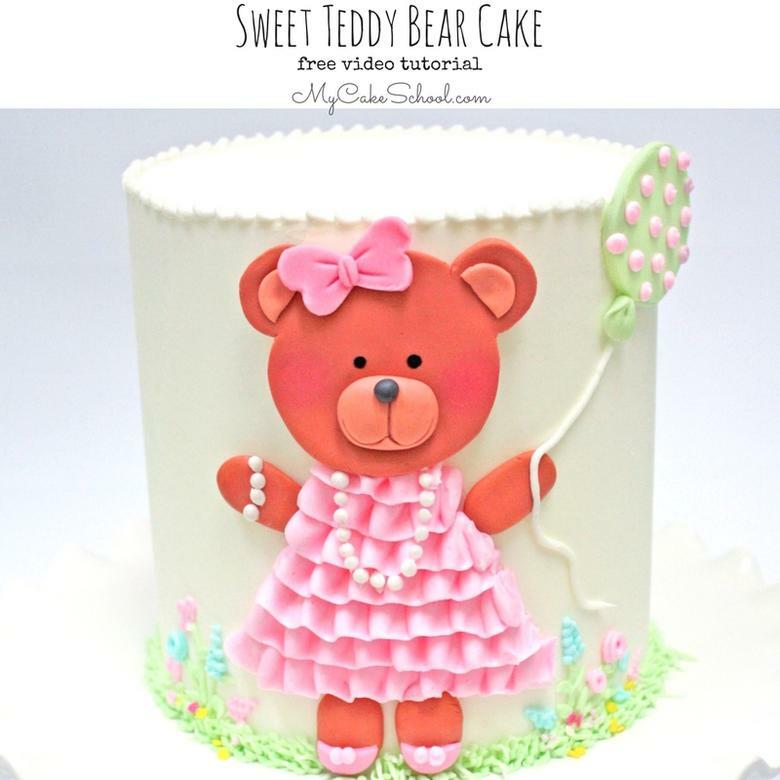 Today I’m going to share an adorable Teddy Bear themed cake tutorial that would be PERFECT for baby showers and young birthdays! I love sweet and simple cake designs, and this is one that is suitable for for any skill level of cake decorating. We hope that you enjoy it! The cake in this tutorial is a 4 layer double barrel 6 inch cake, frosted in our Fluffy Vanilla Buttercream Frosting recipe. 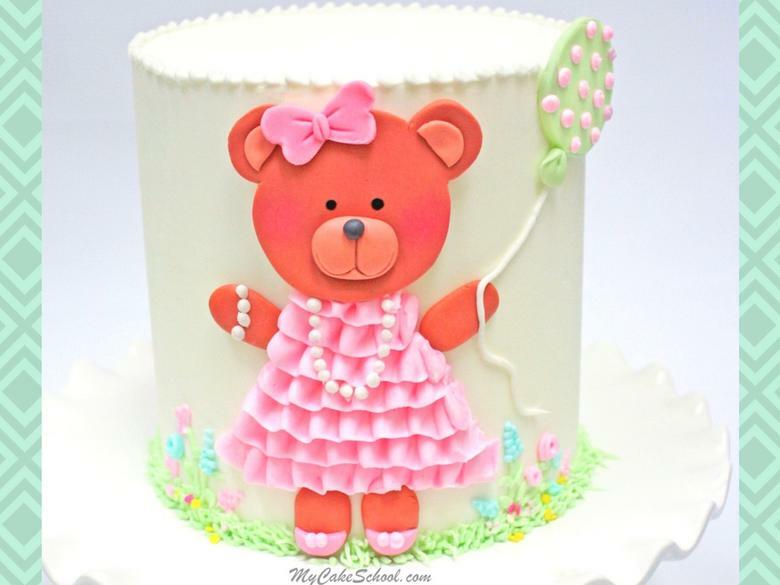 However, the sweet teddy bear cake design could be transferred to cakes of all shapes and sizes, and would even be adorable for a sheet cake! Be sure to check out our materials list & additional notes below. We hope that you enjoy the tutorial! You can adjust this design to fit any size cake. The cake in this video tutorial is a six inch 4 layer cake (double barrel), frosted in Fluffy Vanilla Buttercream. (The cake is sitting on it’s own cardboard cake circle cut down to size. The bottom two layers have 4 bubble tea straws within them to support the top two layers. The top 2 layers are sitting on their own cardboard cake circle cut to size. I smoothed the buttercream using the Viva Paper Towel Method. Use your method of choice for smoothing. Thanks for stopping by! Don’t miss our full collection of favorite cake and frosting recipes in our Recipes Section, or even more Free Cake Tutorials! Finally, members of My Cake School have full access to hundreds of cake decorating video tutorials! For more information on joining, click here: My Cake School Membership Information . We’d love to have you!! « Roundup of the CUTEST Baby Shower Cakes, Tutorials, and Ideas! Holy moly – that is the cutest cake ever :-) I love it! Super sweet and simple – my favourite! Thanks MsGF!! xo Happy that you like it! 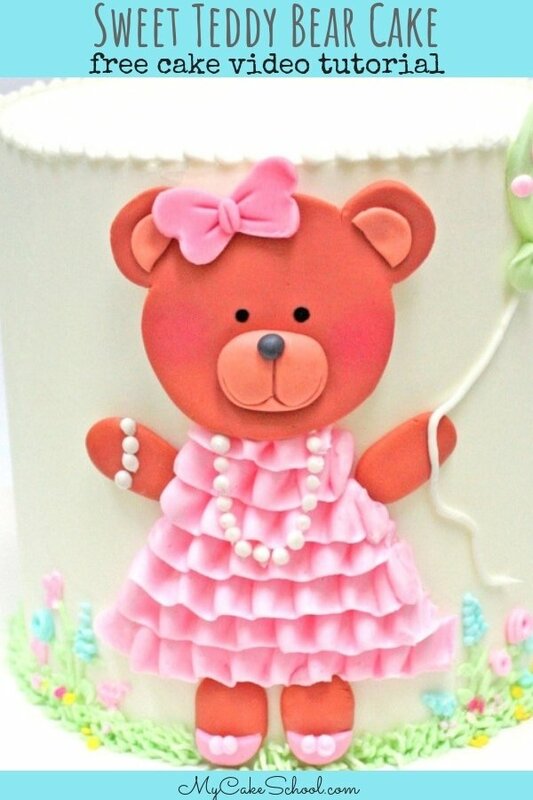 Wow, simply stunning teddy cake and sooo cute. I am going to give it a try for my daughters 2nd birthday. I have several questions though. How many people would you say it would serve? Also what cake recipe do you suggest and could you make it in 8 inch pans? Im thinking possibly vanilla and chocolate but open to ther flavours. Is it actually 4 individual cakes or 2 cakes cut in half? Thank you so much. Love your tutorials! Love that cake , so cute. I must say u have a magic in your hand its beautifully crafted cake……fantastic job. I really love this teddy, my son’s birthday is coming up next week – I will try it soon. Great cake but the petal dust did me in. Next time I think I’ll let the bear go all natural. Awwww….your cakes are adorable, Margaret!! I’m sure that they loved them! Love that you put the design on a sheet cake. Yes, the bear would look sweet with or without petal dust. Just as a side note for future designs, if you keep a little bottle of vodka on hand for cake decorating, it acts as a great eraser for removing petal dust, coloring gel, food coloring pen, etc. off of fondant. Just dampen your paper towel with it, and gently rub over the area that you want to erase. The alcohol evaporates quickly, leaving the fondant dry after just a few minutes. Hi Melissa, I am planning to make this cake for my daughter ‘s 2nd birthday. I am thinking of making orange sponge cake and filling the layers with whip cream. Doing the crumb coat with buttercream. Will that be ok.
Hi Hazel, Yes, that will be fine. Since the filling is whipped cream the cake will need to be refrigerated. The whipped cream will be fine for a couple of days but will begin to gradually deflate. We have not had a problem refrigerating a cake with fondant accents. Take the cake out of the refrigerator a couple of hours before serving so it will begin to warm up before serving. Hi Melissa and BeBe, thanks for the reply. One more question can I freeze the sponge cake for couple of days like you’ve shown or is it better to keep it in the fridge. Hi Hazel, Do you mean freezing the cake layers? It is fine to bake ahead of time and freeze the layers individually. Wrap in plastic wrap and then aluminum foil. It is important to keep them air tight. We have frozen layers 2 months with no problem. If you wrap the layers while still warm, it makes them more moist. If you were asking about the completed cake, we don’t freeze our decorated cakes. You could refrigerate, putting it in a bakery box and covering in plastic wrap. The frosting also helps to keep the cake from drying out in the refrigerator. Hope all goes well. Hi Melissa and Bebe, Thank you for helping to achieve this cake. My buttercream didn’t come as white as yours. Hi Hazel, Your cake is just perfect!! Great work!! Thanks so much for posting your picture, I loved seeing this. Recently discovered your tutorials. Beautiful simplicity! Wonderful. A question about the cake height. You say double barrel, 4 layers, but everyone’s layers are different heights. So would this cake be a total of 6 inches high or closer to 8 inches high. While it could be done with any size cake as you say, I think that the proportions are important. Awaiting your response. Thank you. Hi Francine, the completed double barrel cake would be closer to 8 inches high. There would be 2 layers on a cake board (for easier transporting) dowels put in place and a cake board placed over the dowels. Then 2 more cake layers added — each layer being filled with frosting. To serve the cake, cutting down to the first cake board would give you a serving. After the first two layers are served, remove the cake board to cut the final two layers of cake. Depending on the size of the serving you could serve 20 to 24 with this cake. I just found you, I’ve watch a couple of your videos and you take your time and explain everything. You have shown us how easy it can be to make the cakes. Thank you so much. I absolutely love your videos.